SB Plant Invigorator (SBPI) is an environmentally friendly Pesticide, Mildewcide and Foliar Feed for use on all edible and ornamental crops. The world is becoming much more â€˜environmentally awareâ€™ and large supermarket chains are demanding lower and lower minimum residue levels (MRl) in fruit, vegetables and now even ornamental crops. SBPI can be used by professional and amateur growers and gardeners worldwide. It helps to produce quality fruit, vegetables, flowers, bushes, shrubs and trees and controls a wide range of important pest species that include Whitefly, Aphid, Spider Mite, Mealybug, Scale and Psyllids. The SBPI has a â€˜physical mode of actionâ€™ which is non-chemical and non-biological. If applied correctly pests will not become resistant to SBPI. There is no harvest interval after applying SBPI. Plant stimulant foliar feed for strong healthy growth. Controls plant pests including Whitefly, Aphid, Spider Mite and Mealybug. Pests will not become resistant. Plant wash for a cleaner, shiny appearance. 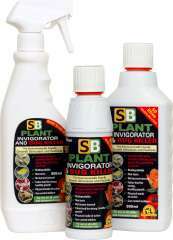 SB Plant Invigorator is available as a ready to use spray, or as concentrate.